A scientist from the Senckenberg Research Institute in Frankfurt has discovered the first eyeless huntsman spider in the world. The accompanying study has been published by the scientific journal Zootaxa. The regression of the eyes is attributable to living permanently without daylight. This adaptation was also observed in other cave-dwelling spider species by the Frankfurt arachnologist. The Sinopoda species described demonstrate all kinds of transitions to cave adaptation  from eight functioning eyes to forms with six, four and two lenses, right up to blind spiders, explains Jäger. The spiders are in good company: fish, scorpions and crabs that have adapted to caves have already been found in the caves of Laos. 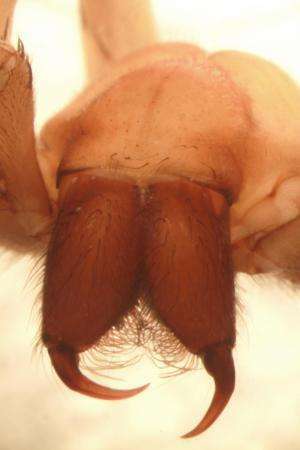 In total, the Frankfurt spider researchers have described nine new species of the genus Sinopoda. The fact that all of the species have been found in caves confirms the animals preference for underground habitats. Because of the small-scale area in which the spider species can be found it is possible to study their adjustment to the cave as a dwelling  the number of eyes present and the visual faculty may possibly shed light on the time of settlement. Furthermore, the spiders can be used as indicators for the threat to their habitats. These are often endangered by tourism or the exploitation of the limestone rocks to make cement, says Jäger. 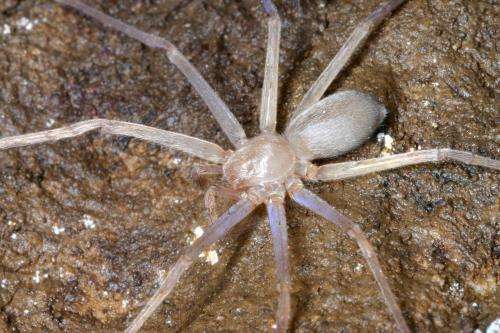 We already knew of spiders of this genus from other caves, but they always had eyes and complete pigmentation. Sinopoda scurion is the first huntsman spider without eyes. OK, was it just me, or is that just the opposite of what every show about caves has told me. Cave dwellers also loose their pigmentation, and the eyes are the next to go, either the eyes are still present but non-functioning or are gone completely. I guess this spider finally figured out a way to deal with no eyes, possibly using hairs to detect vibrations or something similar.